Ridgeway have a brillaint saving on LED rechargeable 20W 6500K yellow fixture and black lamp floodlights. 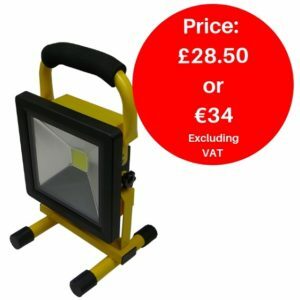 The LED rechargeable 20W 6500K yellow fixture and black lamp floodlights provide extremely useful and versatile lighting solutions for workplaces, tradesmen, transport and camping. They come supplied with in-vehicle and UK mains chargers. To take advantage of this great offer please click here or call, Belfast +44 (0) 2890 45459 or Ashbourne +353 (01) 8027173. Alternatively visit www.accessandsafetystore.com or click the button below to submit your enquiry via email.